Hello there! We’re so excited to be back and sharing this amazing group of puppies with you! There are such charming, vibrant personalities in this group and we love weeks like this when we know that so many of our pups are going to make absolutely amazing pets for their forever families! Ridgewood puppies go home with their puppy shots completed, not just the first set like at so many other places. They also go home with our lifetime warranty, which is well beyond the 30 day guarantee that the state law requires. Our staff is here to make this experience fun and informative for you, so don’t hesitate to call if you are interested in someone! We’ve got lots of newbies this week, so we’re going to get right to it! Enjoy the new pups below! This week, Ridgewood welcomes Lollipop, Hawthorne, Tolstoy, Stoker, Daffodil, Xander, Xara, Bunny, Chick, Lamb, Marbles, Archie, Paulie, Kellen, Keely, Kyleen & Vivienne! 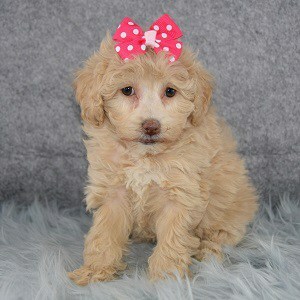 First up we have Lollipop, a female Shihpoo! This adorable little girl has such a one of a kind personality. 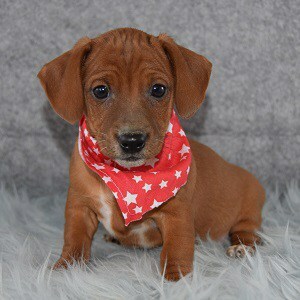 Just one of those pups that is so special to us and we can’t even put into words why! Lollipop loves a good romp in the play yard but is all about her humans. She sits next to us, staring into our eyes while we resist the hypnosis. “We will not cuddle her, we will not cuddle her, we will not-okay, we’re cuddling her.” Not that we mind of course, but if we did, resistance would be futile with this charming, gentle girl! She is an absolute doll, is so loving, wonderful with children and we’re so jealous of whoever gets to call her theirs. Stop in or call today to make that you! Now we know a lot of you have been waiting for Jackshunds and here they are! Hawthorne, Tolstoy and Stoker are three very happy-go-lucky, very sweet pups! While they do enjoy a good long playtime, their names were chosen because they seem so wise, calm and gentle during snuggle time. Like little intellectuals! It’s so adorable and we just love the little personalities on these cuties! 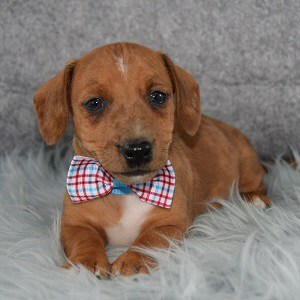 They are half Jack Russell Terrier, half Dachshund and will make great playmates for children or great companions to always be by your side! These boys can’t wait to meet you, so feel free to visit them anytime! Daffodil is up next! 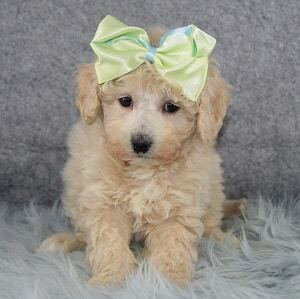 This gorgeous little Teddypoo is a mix of Bichon Frise, Toy Poodle and Shih Tzu. She is that perfect mixture of fun and sweet…a firecracker in the play area and a sweet little angel during quiet time! Teddypoos are a wonderful mix for children and they train very well. Daffodil joins her sister, Tulip in the hunt for a forever family and she can’t wait to get started building a great life with you! Give us a call or reserve her online today! Up next, we have two little Cockapoos very dear to our hearts! The whole litter has such perfect personalities! Xander and Xara are no exception! These two sweethearts do not accept frowns or bad moods. No sir. Turn that frown upside down, they always tell us with kisses and snuggles and silly antics in the play area! Cockapoos are a wonderful breed for families with children and they typically train very quickly. This is a great breed for first time pet owners and people who want a friendly, easy going pet! Visit with these cuties anytime, or place a deposit online to make one yours! Now we have three sweet Bichonpoo sisters! Bunny, Chick and Lamb are very eager to start their lives with you! In typical Bichonpoo fashion, they are pretty much eager for anything! Everything is exciting, everything is just the most awesome, and every person they meet is the coolest ever! These girls certainly have happy, joyful personalities, and we don’t know what the world did to deserve them, but it certainly is a better place for having them in it! Bichonpoos are a great choice if you need a hypo-allergenic puppy and they are a fabulous with children. If any of these girls interest you, give us a call today! Sweet Marbles is up next! 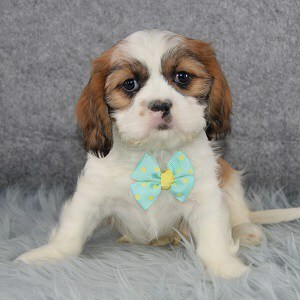 This laid back pup is a Cava Tzu, half Cavalier King Charles Spaniel, half Shih Tzu. What a sweetheart he is! In the play area, he definitely prefers to BE entertained rather than to do the entertaining. He’ll sit and watch the other pups, occasionally joining in, then finding a human lap again when it gets a little too intense for him. He’s definitely a great candidate for someone who wants big cuddle bug to always be by their side! Marbles can’t wait to start bonding with you so visit him today or call to make him yours! Now we have Archie! This amazing puppy is hands down the class clown this week. We don’t play favorites around here but Archie is a go-to pup when you need some silly, fun, cheer up time! 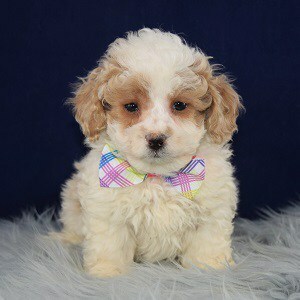 He is a mix of Shih Tzu and Bichon. Gets the snuggle from the Shih Tzu and gets the goofy from the Bichon. He’s quite the perfect pup in personality! If you’re looking for a good time pup, who knows how to party, but has the most gentle little soul, then Archie is your guy! Pop by to make him yours today! 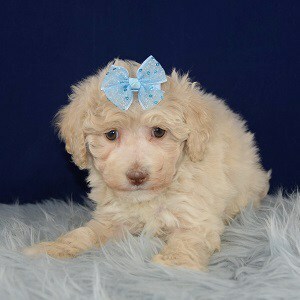 And now we have a darling little Poodle, Paulie! This sweet boy is a great choice if you’re looking for a lap dog to always be by your side! He’s looking for a bff (or bffs) and can’t wait to start bonding with you! 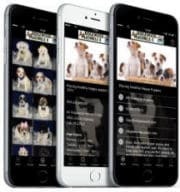 Poodles are highly intelligent and love to please their owners. They’re non shedding and are wonderful for people who have allergies. Paulie is just an amazing pup. He loves to snuggle, plays so nicely and quietly by himself, and has the most gentle and well behaved spirit. We love this kiddo so much! 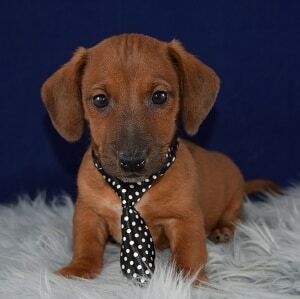 Stop to meet him anytime, or reserve him over the phone today! 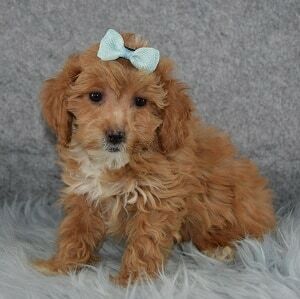 Now we have three absolutely gorgeous Cavapoo puppies! Kellen, Keely, Kyleen just have those perfect, chubby faces that we want to kiss all day long. And they’re happy to let us! Cavapoos are a great breed for families with children, and while they’re good for quiet time indoors, they are a great choice for families who love to travel, or take their pup everywhere with them to make new friends. Kids soccer games, picnics, camping trips…Cavapoos love it all! These three are very gentle pups who enjoy their nap time immensely, but have no problem turning into social butterflies and making best friends with everyone they meet! You’re welcome to visit these cuties anytime, or reserve one on our website today! 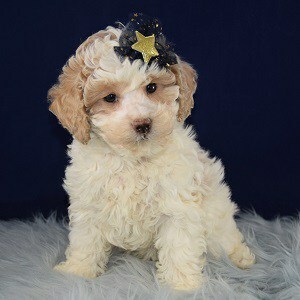 Last for this week, we have a beautiful female Poodle, Vivienne! This is a girl who knows her own mind and has no problem putting all the bigger puppies in their place during playtime! Small but mighty when she needs to be! Vivienne loves to be cuddled and will make a great lap dog. She’s great with children who can be gentle with her, and is so excited to start bonding with a forever mommy or daddy! Stop in anytime to meet these sweetheart, or give us a call today to make her yours! Thank you so much for checking out all these pups! They’re all eager to find homes, and we’re open seven days a week for them to do so. Visit anytime, or give us a call and we’ll be happy to answer any questions you may have! See you back here next week!